A probe from Earth trundles around on the surface of Mars and then abruptly vanishes. Unsure of what to do, one of the scientists on the project, Dr. David Fielding (Kent Taylor) decides to spend time with his family whom he hasn’t seen for weeks. He finds his wife, Claire (Marie Windsor), has taken the kids to her empty family estate. David and Claire both see each other in parts of the house that they shouldn’t be in at the time. Soon it is revealed: Martians are duplicating the Fielding family to silence anyone who wants to send more probes to their planet. 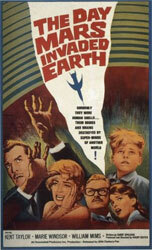 The Day Mars Invaded Earth successfully replicates some of the tension of Invasion of the Body Snatchers (1956). Keeping the cast small and isolated prevents the conspiracy of doppelgangers from feeling huge, but it does create a pressure cooker situation. Invasion of the Body Snatchers keeps the story moving along by offering the faintest hope that the pod people can be defeated. The Day Mars Invaded Earth offers no such hope, The Fielding family is hopelessly outmatched from the get go. This flavors the story with a sense of doom that feels as oppressive as the silent and empty mansion in which it takes place. This better be that Slayer album I asked for. The mansion is another character in the story. It’s a vast sprawling place that threatens to swallow the family whole. The fact that it is empty and quiet makes it feel haunted, and I suppose with Martian duplicates sneaking around, it is. The Fielding family actually has a bit more texture than I expect from an early 60s SF film. The Fielding’s son, Rocky, is straight out of the 1950’s gee-whiz kid playbook, but his parents are another matter. It’s rare to see a couple straining under career demands in the relatively simple relationship dynamics of most SF films from this period. To have Claire separate herself from David and then have them both struggle with his constant absence is a surprise. It also serves the story by creating an air of distrust that grows as they began to suspect something strange is happening in the house. I'll have a drink, make it a double. The Day Mars Invaded Earth isn’t a dynamic looking film, but it doesn’t need to be. It’s shot very simply, using the large interior and exteriors of the house to confine or give a sense of scale as needed. The few shots that require a double exposure, so that the same actor can be both human and Martian duplicate are managed very well. There is an impressive long dolly shot with actor, Kent Taylor handling both sides of a conversation. 1963 is the year that a seismic shift in America politics and consciousness helped bring an end to a cycle of SF films that began in the early 1950s. Unfortunately The Day Mars Invaded Earth was lost in this shuffle. It’s creepy and competent little film, with a lot of interesting things going on, including a downer ending that strikes unexpectedly. It’s definitely worth a look.